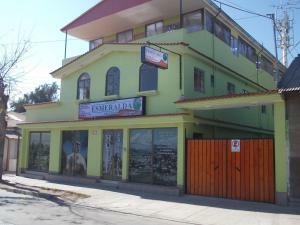 Chic urban-style décor and free Wi-Fi can be enjoyed in a quiet area of Vallenar, 1 km from the main square. A daily breakfast is included and Vallenar air field is a 15-minute drive. Apart Hotel Puerto de Vega has fully furnished apartments with kitchenettes, cable TV and comfortable seating areas. Apartments are fitted with 2 bathrooms. Huasco City is 50 km away and there is free parking. When would you like to stay at Apart Hotel Puerto de Vega ? This apartment can accommodate 4 persons and is distributed in 2 floors.The first floor features a fully-equipped open-plan kitchen, a dining area, a desk, a toilet room, a terrace and a TV with cable channels.The second floor features 2 bedrooms. One bedroom is equipped with a double bed, while the other can have a double bed or 2 single beds, subject to availability.Free WiFi is available throughout this property. Request the username and password upon check-in. Each day we'll check prices and send you an email for your selected dates at Apart Hotel Puerto de Vega. If you don't have specific dates but would like to check prices for say next weekend or say next month we can check the price too. Click to write a review and share your experience of Apart Hotel Puerto de Vega with other travellers.